Product prices and availability are accurate as of 2019-04-20 08:15:53 EDT and are subject to change. Any price and availability information displayed on http://www.amazon.com/ at the time of purchase will apply to the purchase of this product. 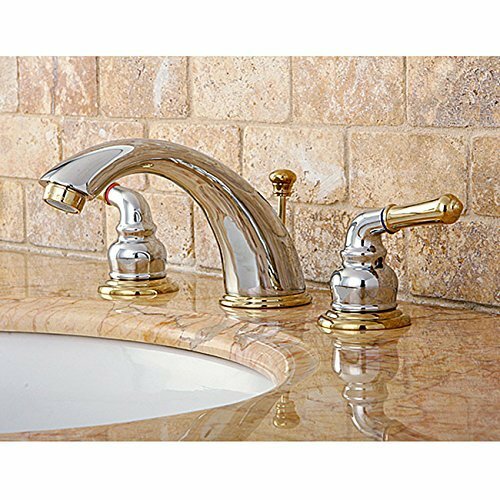 Add lasting beauty and charm to your bathroom decor with this widespread bathroom faucet Faucet is made of solid brass construction. Two-handle widespread faucet. Drip-free 1/4 turn washerless cartridge. All brass pop up-drain assembly in matching finish included. Faucet type: Bathroom Faucet. Number of handles: 2. Finish is a two tone- Polished Chrome & Brass. Spout measures 4 inches high x 5.75 inches reach.